I recently had an epiphany (or Ah ha) moment. I was looking at my closet full of clothes with a variety of pants, tops, scarves etc. and realized that I should be looking at ensembles rather than a variety of individual pieces of clothing and then … deciding how to coordinate them. 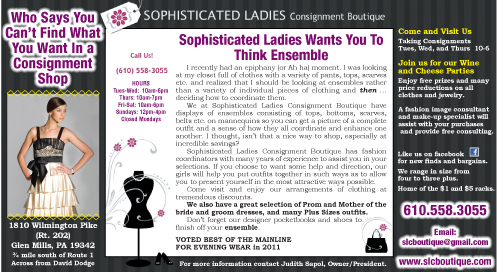 We at Sophisticated Ladies Consignment Boutique have displays of ensembles consisting of tops, bottoms, scarves, belts etc. on mannequins so you can get a picture of a complete outfit and a sense of how they all coordinate and enhance one another. I thought, isn’t that a nice way to shop, especially at incredible savings? Sophisticated Ladies Consignment Boutique has fashion coordinators with many years of experience to assist you in your selections. If you choose to want some help and direction, our girls will help you put outfits together in such ways as to allow you to present yourself in the most attractive ways possible. Come visit and enjoy our arrangements of clothing at tremendous discounts. We also have a great selection of Prom and Mother of the bride and groom dresses, and many Plus Sizes outfits. Don’t forget our designer pocketbooks and shoes to finish off your ensemble. A fashion image consultant and make-up specialist will assist with your purchasesand provide free consulting. Like us on facebook for new finds and bargains. We range in size from four to three plus. Home of the $1 and $5 racks.